The longan (Euphoria longan), also known as Dragon's Eye, is a fruit tree native to Southeast Asia. 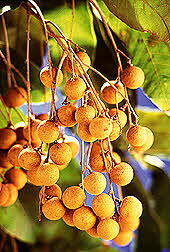 It is a member of the Soapberry family, and a relative of the litchi and rambutan. The longan fruit is cherry-sized, with a thin cinnamon colored shell that is easily peeled, translucent white flesh, and a large single black seed. The taste is similar to the litchi, slightly sweeter, but not as juicy. Unlike the litchi, the fruit of the longan is hard to separate from its seed. Growers in the U.S. are working on developing a 'freestone' variety.